Fleet managers face the unenviable task of maximizing fleet performance and minimizing repair and down time, all while keeping a close eye on fleet budgets that are tighter than ever before. Bell Performance has been supplying solutions to fleet managers like these for years. Bell Performance makes industrial-grade solutions for fleet managers who need to stretch their fleet budget dollar and minimize unexpected problems with their fleet vehicles. Whatever the need, Bell Performance has solutions that work. Fleets across the state of Florida and around the country trust Dee-Zol to take care of all of their most common diesel fuel concerns in one multi-function treatment. With combustion improver, powerful detergency, lubricant and its highly-effective surfactancy package to control water, Dee-Zol has been the product of choice for many fleets since 1954. Bell Performance diesel products are also tailored to provide the single-solutions that many fleets are asking for. 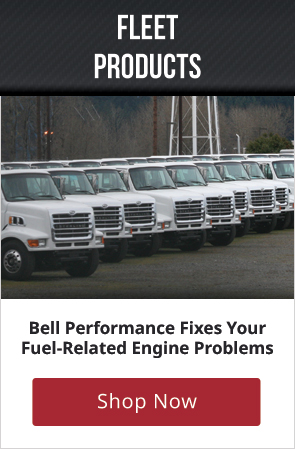 Ultra-low sulfur diesel lubricity problems are solved by Bell Performance Lube-Pro. Poor quality, smoking diesel fuels with low cetane ratings are improved with Bell Performance Super-Tane. Fleets that store diesel fuel for later use rely on DFS Plus and Dee-Zol Life to remove water and keep the fuels free from quality-destroying oxidation. Fleets looking for the best competitive advantage in their unit performance will turn to X-tra Lube Concentrate engine oil treatment to make their older worn engines like new. Whether municipal or private, fleets have trusted Bell Performance diesel treatments for decades. Because they work. Because they save money. Any fleet manager can appreciate either of these.